In life there are few truly unlimited things. There’s God. But even He’s limited to His nature (He can’t sin, for example). Often “unlimited things” come with fine print that controls the expectations. Think about unlimited data for phone services or cloud storage. Ministries have limits and certainly you’re not unlimited. 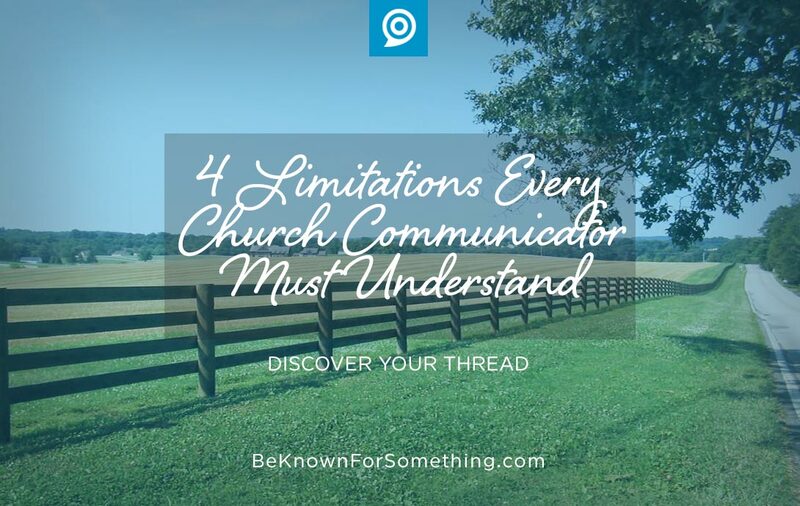 In order to establish a rhythm in church communication ministry, you have to identify the major limitations so that you can mange around them. Time. This is two-fold. People don’t have a lot of time. So we must edit all messages and limit what we dump on them. People want only the facts and just things that matter to them. Their attention span is extremely limited. We must stop communicating before they stop listening. Secondly, we’re all limited to 24 hours in a day and 7 days a week. We require enough rest in order to accomplish the best ideas in our limited work time. We’re limited. Managing time and capacity will be a constant struggle in communications. Most times, a creative doesn’t need a ton more time; we just need challenging deadlines. Become talented at creating them for yourself. And others. Talent. We believe that the sky’s the limit for creativity. But it’s not. Your limitation for creativity becomes the ability to accomplish the ideas. An undeveloped concept is a waste. We often don’t need new ideas. We just have to continually learn how to have the talent (and time) to accomplish the ideas we’ve already had. You can’t do it all yourself. You need to be constantly recruiting or enabling new talent in others. Your ministry needs to be about that empowerment. Be known for encouraging talent! Leadership. I remember thinking that one day I’d be the boss and not have to answer to someone. Having run my own agency for 15 years, I have to tell you that 1) it’s easier when you have a leader over you, 2) even when you don’t have an official “boss”, you have people who call the shots, and 3) God is always your life’s Leader. Stop trying to control everything and learn the Godly concept of servanthood. Your leaders will always limit you. Get over it and work with them to accomplish great things. Tools. I was working in Photoshop the other day and realized what I was trying to accomplish wasn’t capable within this incredibly powerful application. Every piece of software, hardware device, pen, process, etc. will have limitations. Take the time to know them and know what can be accomplished through them. Then try to overcome the boundaries by pushing the limits. Usually there’s a good reason for limitations. Start working within the boundaries that we have. You’ll stop complaining about the fences and instead fully utilize the open pasture where we all can dance!